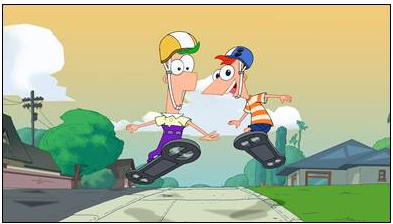 With 104 days of summer vacation right around the corner, Disney XD bids farewell to Phineas and Ferb, the greatest backyard adventurers of all time, with a 37-hour marathon featuring every episode ever from the fan-favourite series. Kicking off at the crack of dawn on Saturday, June 13 at 6 a.m. ET, fans can relive the stepbrothers’ greatest summer escapades, Candace’s biggest brother-busting attempts and the infamous rivalry between Perry the Platypus and Dr. Doofenschmirtz. The marathon culminates with the hour-long series finale on Sunday, June 14 at 7 p.m. ET. In the final episode, “Last Day of Summer,” Candace has one final chance to bust her brothers before the summer season comes to a close. As usual, her efforts are thwarted until she gets the chance to redo the day with Dr. Doofenshmirtz’s newest machine: the Do-Over-Inator. Suddenly everything turns topsy-turvy and as the dastardly device rips into the space-time continuum, the days get shorter and Phineas and Ferb disappear entirely. Fans that miss the original broadcast won’t need a Do-Over-Inator to watch the episode – the series finale will be also available on Disney XD OnDemand beginning June 15. Highlights from the Phineas and Ferb Weekend event include: a 2-hour celebration of the series’ zany original music beginning Saturday at 10 a.m. ET; Phineas and Ferb: Star Wars airing Saturday at 3:30 p.m. ET; the Disney Channel Original Movie Phineas and Ferb: Across the 2nd Dimension on Saturday at 6:30 p.m. ET; Phineas and Ferb: Mission Marvel, featuring guest appearances by superheroes, airing Sunday at 1:30 p.m. ET and much more! For a complete schedule of events, please visit DisneyXD.ca. The farewell bash continues at DisneyXD.ca where fans can play the nostalgic new game “Replay Rush.” Dr. Doofenschmirtz’s Do-Over-Inator will take gamers on a journey back through time as they revisit mini versions of their favourite Phineas and Ferb games, unlock new games and collect points. Adding to the excitement, every Phineas and Ferb game ever made – 42 to be exact – will also be available on the website for a limited time. This entry was posted on Friday, May 29th, 2015 at 8:14 am and is filed under Animation, National News. You can follow any responses to this entry through the RSS 2.0 feed. You can leave a response, or trackback from your own site. … 37 hour marathon… what are they thinking? Kids are stubborn enough to sit up for that full run… so are many adults. I see Monday June 15th as not being a very productive day for a lot of people.